Shopping for other people can be hard sometimes. Who doesn’t like some awesome hair and beauty products for the holidays. I put together some products that pair well together to make up a perfect beauty bundle. Use my pre-made selections or make one up of your own. Give the gift of happy holiday hair with a beauty box for someone you love, or make one for yourself. Oribe Gold Lust Transformative Masque– This masque will transform your hair by rebuilding it’s elasticity with white tea, baobob and jasmine extract. Re-discover your hairs beauty and shine. 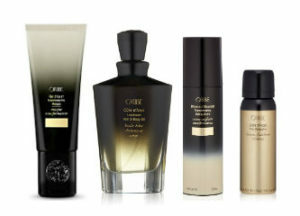 Oribe Hair Care Cote d’Azur Hair Refresher– This is amazing!!!! It’s perfume for your hair. Give your hair a burst of Oribe’s signature scent while refreshing your hair and protecting it from UV rays. Imperial Blowout Transformative Styling Crème– Blowout your hair with luxury and style. This blowout cream helps to smooth your hair and give you a long lasting blowout with body and shine. 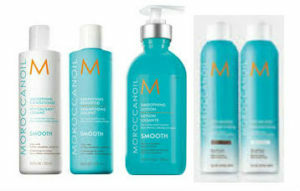 Moroccanoil Smoothing Shampoo & Conditioner– Help start to get your hair smooth in the shower. Tame your frizzy hair with the awesome shampoo & conditioner that’s infused with argan oil, argan butter and vitamin E.
Moroccanoil Smoothign Lotion– This smoothing lotion helps cut down drying time and helps fight humidity for 72 hours. Add a pump of this on your wet hair and blowout for shiny, frizz free results. Moroccanoil Dry Shampoo– Help extend your blowout with Moroccanoil’s fabulous dry shampoo. Comes in light tones for blondes and red heads, and dark tones for brunettes. Kevin Murphy Plumping Shampoo– This shampoo helps stimulate blood circulation to the scalp to help promote growth. Ginger root and nettle extracts strengthen and densify fine hair while adding volume and shine. 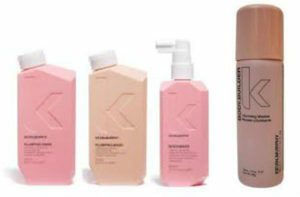 Kevin Murphy Plumping Conditioner– KM plumping conditioner helps nourish the hair without weighting it down. Apply from the bottom up stopping an inch from your roots. Kevin Murphy Anti Gravity Spray– Spray on your roots, then blow dry into your hair to add volume right at the root leaving you with all day bounce and lift. Kevin Murphy Body Builder Volumising Mousse– Don’t leave the mousse in the 80’s. Apply all over then blow dry to help plump up your hair from roots to ends.